Patchy Work of Mini Grey: WIP Wednesday Week 5. Okay, so its not Wednesday, its Thursday were I am, but its still Wedensday over at Freshly Pieced so I'm letting it count! Yesterday was the last day of my summer holidays and I spent it sewing with the intention of blogging after dinner. But then we had a big storm come through and the whole town lost power for about four hours, most inconvient! 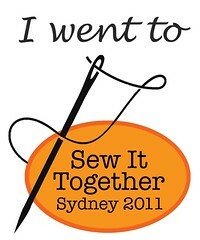 Lucky it wasn't during the day as then I couldn't have got any sewing done. I finished the top to this runner earlier this week. Its not as big as I had hoped. Thats what you get for using mini charms I guess. The friend this is for has a massive dining room table and this would just look lost on it. So I'm pondering between making something else or just giving it to her, I mean she might not want to put it on her massie dining room table? I'll ponder that as I quilt it, I have the backing fabric selected, just need to unroll the wadding and cut some to size. But instead of reaching for that roll of wadding, what happens? I start another project! 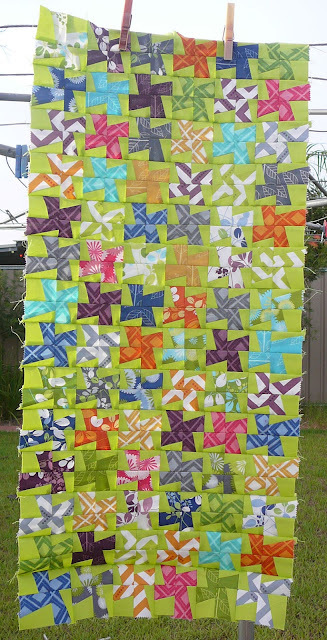 I have seen so many lovely scrappy Trip Around The World quilts on flickr and on blogs, it has been very inspirational. So I decided to start making one, as you do. I'm using the tutorial over at Quiltville which is awesome. 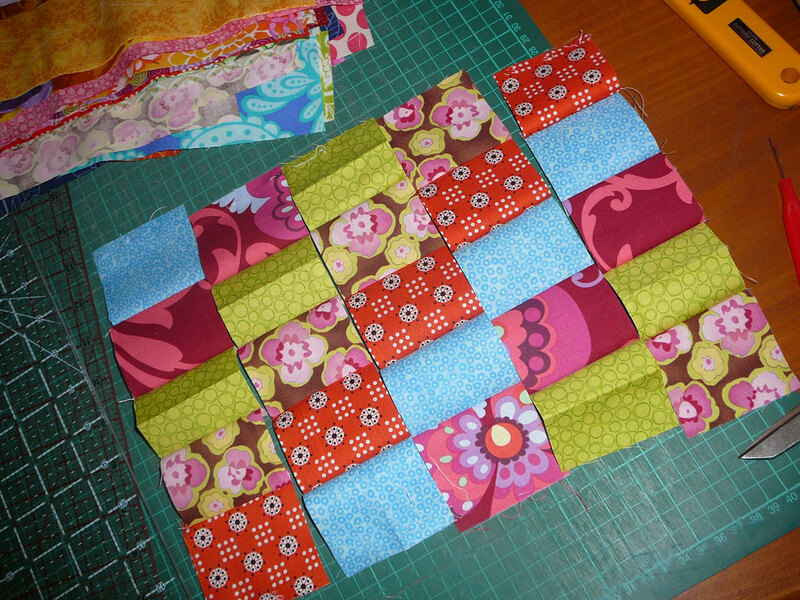 The tutorial is for a block with 6 squares, I didn't want it quite so big. so I made mine 5 squares. Which was fine until it came to the ironing part, I have to fold one in half in the tube. Those of you that have made the block like in the tutorial will understand the ironing tube bit hopefully. So here are the first four blocks, colourful! I'm slipping some fabric in there which is orphaned and will most likely never see the light of day. I have a heap of strips cut ready to go, after I go unroll that wadding perhaps?! I'm in the process of culling my strip stash for a scrappy trips quilt, too. I'm going to make blocks until I run out of strips - then I'll make several smaller tops instead of one giant one (or runners, or pillows, or ???) Those strips NEED to be used instead of hogging shelf space! 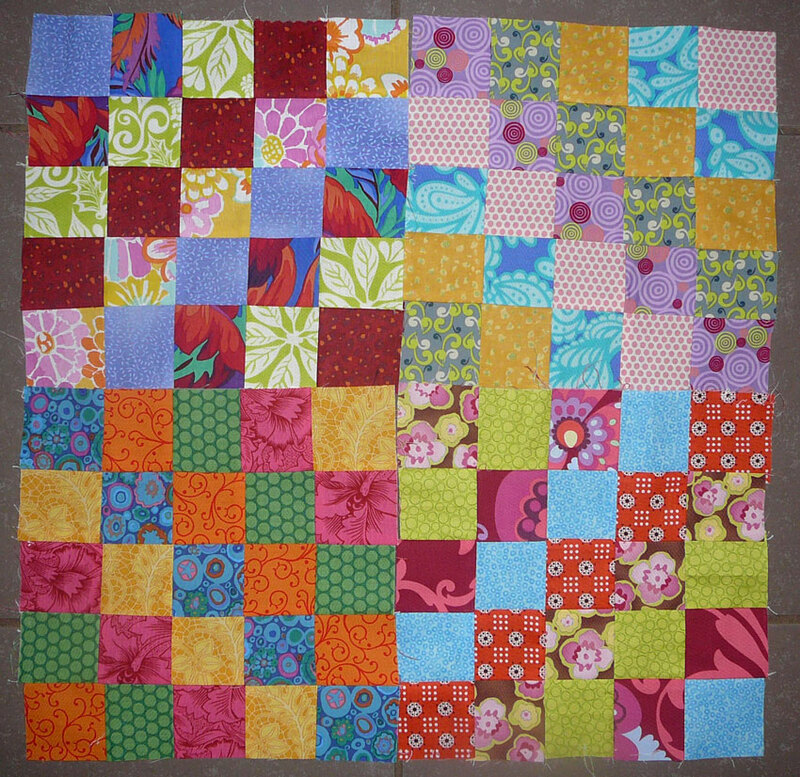 I really like the first quilt top with the pin-wheel-like top. I have two charm packs of Simply Color. Is that what you used with the green? =). Did you use a certain ruler or pattern?